If you’ve read my blogs before you know that I rarely use flash as a main or even as fill when I do photography outside. It just does not blend well with natural or even continuous artificial lights. The great thing about our professional digital cameras is that we can use much higher ISO’s, with less noise, longer exposures, (on a tripod) and with the recovery possible using RAW files, it’s amazing what can be accomplished now without resorting to supplemental flash. As an example the following commercial shoot I did outside about an hour after sunset was done with only the existing ambient and the continuous artificial lights at the location. I wanted those white Christmas lights on the truck to stand out; if I had used flash not only would those lights have all but disappeared, but the snow would have been way too bright. The key to this image working was proper exposure of the highlights without too much under exposure of the darker areas. 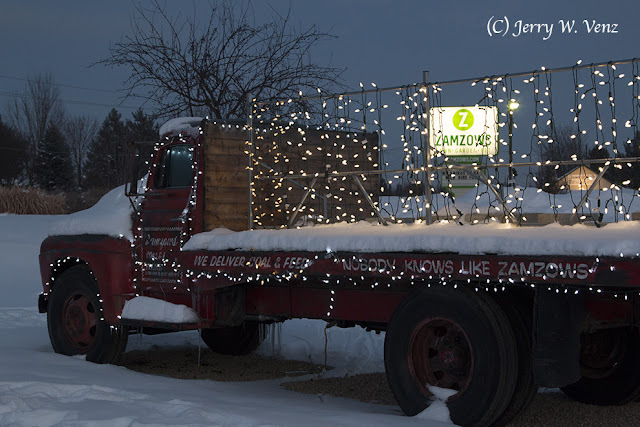 The most important highlight area was the large lighted Zamzows sign that was about 25 yards behind the truck. So, I exposed for that lighted sign and let the truck go a little underexposed. However, since upon reviewing the image on my camera I saw that I could read the lettering on the truck and I still had detail in the deep shadows I knew that I could recover all that underexposed area in post processing. Here is the original file…. It’s remarkable what can be done just using Adobe Camera Raw to bring down highlights or recover shadow detail; ACR can recover 2-stops or more in a RAW file.